Kenya will soon boast of a regional training center to nurture talents and host global tennis tournaments after ground was broken for the construction of the ITF training Centre at Moi Kasarani Stadium on Friday. International Tennis Federation (ITF) President David Haggerty was the key guest during the landmark event that will put Kenya at the apex of international tennis. Haggerty lauded Kenya’s move to setup a regional tennis-training base as it will improve the sport in the country beside numerous benefits that include sports tourism. The new center will be built on 10 acres of land set at Kasarani at a cost of Ksh 1 Billion and will boast of an administration block, twenty-four tennis courts with floodlights and hostels. 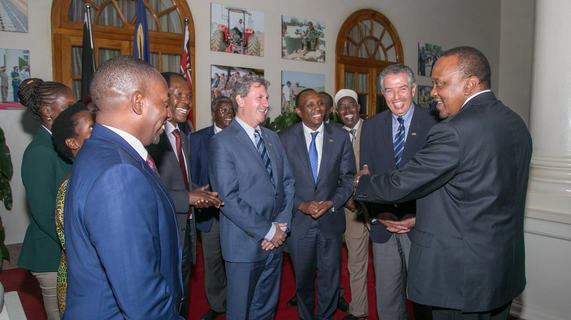 The ITF President also met President Uhuru Kenyatta who committed to ensuring Tennis becomes a household sports in Kenya. “Tennis has not been available to our people. We want to make it a public sport that is open to the people. The talent is there but it is facilities that have been lacking,” said the President Kenyatta. The Training Center will host the International Tennis Federation training centre for Africa and will be the first of its kind in Africa.The other ITF training Centre in Africa is in Morocco but the Kenyan one will have the distinction of being at a high altitude. On March this year, 23-time Grand Slam singles champion Serena Williams vouched for Kenya to host one of the World Tennis Association Tours in order to tap the enormous talent in the continent.